Finally, perform self-timer snapshots in a handful of seconds, rush, pose hiding her face and, in most cases, achieve a disastrous or unwanted effect, accompanied by hematomas or small accidental injuries. Polly Penrose takes her pictures in the light of day, without any additional means. She reacts instead, accessorizes it with her body without a precise identity, and realizes the idea in the urgency of the photographic self-timer. The images of Polly Penrose are the result of performances, anonymous body self-portraits, devoid of any eroticism. If she hides her face, she admits, because she does not have the courage to show herself as a person and, moreover, when her face accidentally appears due to the precipitation of the pose, she always considers that identification broke the point. In this it is part of the lineage of photographer such as Ren Hang, Yung Cheng Lin, Pixy Liao or Butz & Fouque. The photographic session is above all a physical relation instead, a syncopated dance in anonymous self-portrait, to personify the clichés it would be to introduce the risk of narration and erotisation. Moreover, in the same register, but precisely with a narrative dimension, we can mention Anna di Prospero. 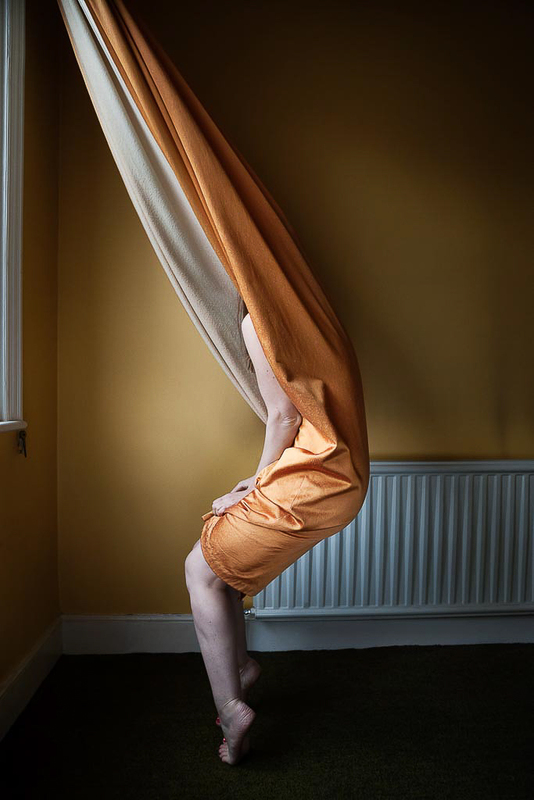 Polly Penrose is, in some respects, close to the Fluxus movement which saw performances as a game of ideas or words executed according to a pre-established score. Finnish photographer Elina Brotherus has reactivated this approach in photographic series with similarities to Polly Penrose. There is, however, a notable difference in the sense that Elina Brotherus’s self-portraits are truly autobiographical, at least in part, and they strictly follow the following pattern: an idea, a procedure, an image. For Polly Penrose the idea is above all intuitive and suggested in a contingent way by the houses where she goes. It is above all a dance with the place and the body becomes an element that must find its place. Visual sculpture does not only lie in the pose of a body in front of a decor of circumstance, the “photographic sculpture” is an installation of the body in a space, the whole forming the place like portrait and resultant of a dance-performance. In this respect, Polly Penrose’s “sculpture-images” are reminiscent of Erwin Wurm’s work, including the One Minute Sculptures and Photographic Sculptures, through humor and more or less surreal disruption. In the action of the self-portrait as an accessory, the body is not the vector. This role is devolved to the place. As for the body, it is the incongruous, heterogeneous element, the accident in the setting which thus becomes a sculptural ensemble where animated and inanimate hybridize during the time of a solitary and fleeting happening. There was the Land Art, the Body Art, and if we dared the Props Art. Thierry Grizard, a graduate in philosophy at the Sorbonne University, former Professor, attracted by the fine arts creation, then embraced various art subjects as a designer, architect and film professional. With a remarkable experience of more than twenty years as a film producer and specialist in special effects, he pursued his passion for the visual arts from an early age not only as a photographer and image creator, but also as a writer of texts focusing particularly on contemporary art, some of which are to be found on the website artefields.net, and that the author enriches successively by other issues related to his collaboration with art historians.